September in Wales marks autumn’s mellow approach as we hang on to the memory of summer. Plas Farm is awash with blackberries come the beginning of the month and great fun can be had hunting for wild mushrooms, hazelnuts, sloes, plums, elderberries, haws, wild mint and if you’re feeling adventurous – crab apples and rowan berries which make a fine jelly. Statistically, September is sunnier than August and can lead into an ‘Indian Summer’. Check the Welsh holiday weather for September. 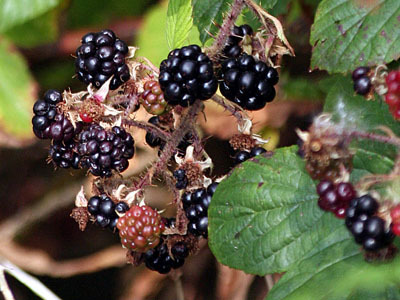 These prickly stemmed plants, sometimes called brambles, grow in abundance at Plas Farm. They are perhaps the best known of all the hedgerow's autumn fruits. 'Brambling' has been a favourite countryside pursuit for generations and everyone has their own 'secret' spot where the blackberries grow thrice the size and are ten times as juicy as anywhere else on the farm. Perhaps this isn't so surprising considering experts believe there are around 400 micro-species in Britain, each one slightly different in its flowering and fruiting schedule and in the size, shape and texture of its berries. For six weeks or more, these stalwarts of the hedgerow provide a feast for wildlife, all of which raid the brambles for the sweet, energy-rich flesh of the berries. The benefit to the bramble bush is that its seed pass undigested through the wildlife diners and are shed elsewhere in ready-manured seed packets. The fruits ripen towards the end of August and are probably at their best come the beginning of September. According to a nature book I have just referred to, their fruit, called bramble fruit, is an aggregate of drupelets. All I know is that an "Aggregate of Drupelets Crumble" tastes beautiful, especially when served with fresh cream and ice cream. This September landscape was taken from the sheltered slopes behind the holiday cottages. The light and colours in the landscape betray the onset of autumn. The foreground is dominated by striking mountain ash trees, laden with red berries. 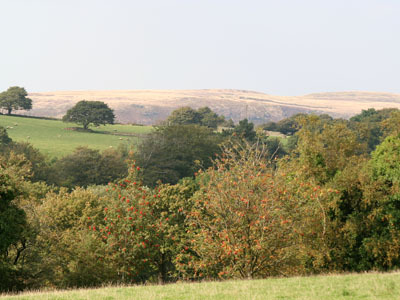 In the middle distance, Welsh mountain sheep graze on grassy slopes and in the far distance, the dramatic ice-carved western side of the Swansea Valley is coloured shades of yellow by the autumn sun. This barren rocky mountain is Allt-y-grug, which translates as The Hillside of Heather. There are a number of specimen beech trees at Plas Farm, including three giants on the lawn in front of the self catering cottages. As the days shorten, photosynthesis grinds to a halt and the resting trees live off the food they stored during the summer. The green chlorophyll disappears from the leaves and we begin to see the colours that were hidden behind the green chlorophyll - yellows, oranges, reds and purples appear to beautify the countryside. The red colouring of some leaves is caused by glucose getting trapped in the leaves after photosynthesis stops. Sunlight and the cool nights of autumn turns the glucose into a red color. 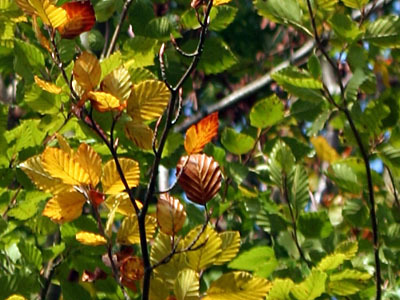 The brown colour of trees like oaks is caused by the wastes left in the leaves after photosynthesis stops. In September at Plas Farm, we see the first signs of the trees getting ready for bed, as this picture shows. 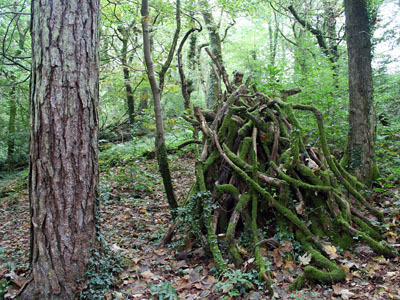 As you walk through the woodlands around your self catering cottage, you may happen across pyramids of wood which are evidence of our attempts to keep the invasive Rhododendron under control. Some of the pyramids are harvested for firewood to use in the holiday cottages, others are left as habitats for wild animals. The moss that now feeds on the decaying wood thrives in the same mild humid conditions that the rhododendron so loves. This picture has a 'Lord of the Rings' feel to it. Few activities bring out the latent hunter-gatherer in us more than foraging for wild mushrooms. After some autumn showers and evening chills, hundreds of types of wild fungus can be found pushing their way through the grassy hillsides and leaf-strewn forest floors. 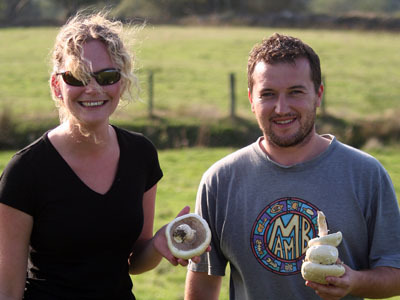 The classic field mushroom is normally found growing in clusters or rings in grazed grassland and they are about ten times as tasty as the shop-bought variety. Remember that if you collect any mushrooms, make sure that your identification checks out in every detail. Plas Farm is managed under an environmental programme that controls the stocking rates in different areas of the farm. 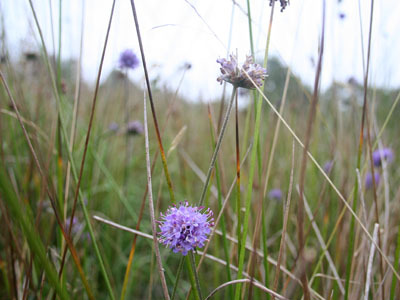 This helps to promote natural biodiversity and ensures that wild flowers such as Devil's Bit Scabious can thrive in their preferred habitat. This picture is evidence of the scheme's success. We are now keeping our eyes peeled for the Marsh Fritillary Butterfly to make an appearance, as Devil's Bit is their favourite food plant. Many beautiful mosses and lichens may be found at Plas Farm, particularly in the woods through which the River Clydach flows. 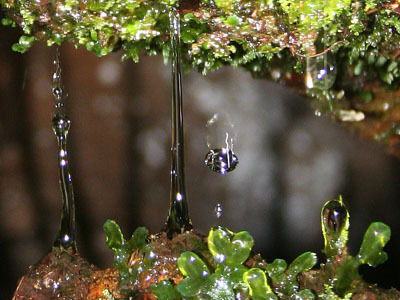 This picture captures the moment a bead of spring water falls down the moss covered sandstone that forms the bank of the River Clydach. 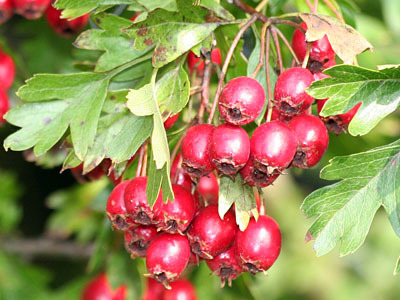 A spectacular sight in May when it is covered in white or palest pink blossom, the red 'haws' of hawthorn are one of September's finest sights. Many ancient trees exist in the Welsh countryside (some may be 500 years old) and it is said that the survivors are largely because of folklore and superstition which obliged country people to respect the tree. 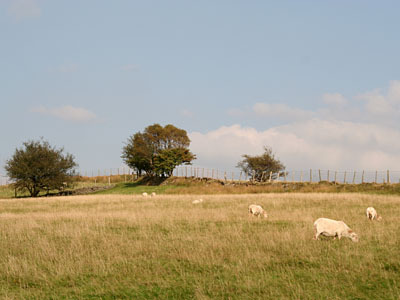 This picture shows shorn Welsh Moutain sheep grazing the uppermost slopes at Plas Farm. Isolated berry ladden hawthorns are dotted along the field boundaries. A fence meanders it's way along an earth bank that runs along the hillside.